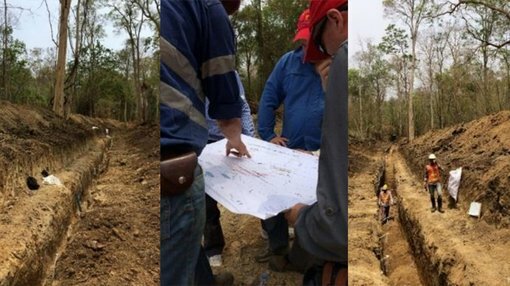 Cambodia-focussed gold explorer Renaissance Minerals Limited (ASX:RNS) has found and confirmed more anomalous gold in soils surrounding its 1.2 million ounce Okvau deposit. The indicated and inferred 15.2Mt JORC resource (at 2.4 g/tonne gold for 1.2 million ounces) Okvau deposit is in an eastern region of Cambodia that’s emerging as a gold producing province and RNS is developing several other prospects in the area along with it. A geochemical sampling programme of soils in three of the prospects has identified and confirmed widespread anomalous gold, and RNS says each will be followed up with an extensive exploration programme. RNS collected and tested over 10,000 soils samples at two areas surrounding its two main Cambodian exploration licenses, Okvau and O’Chhung. The first area tacked was the O’Svay Prospect within O’Chhung exploration license where a coherent and untested 1,000m long gold in soils anomaly was identified through infill soil sampling. The second area explored by RNS was the Zeus Prospect within a section of the Okvau license known as Area 6. A high grade 400m long gold in soils anomaly was found there through trench sampling, which returned best results of 19m @4.1g/t Au gold and 12m @5.0g/t of gold. RNI’s Managing Director Justin Tremain says the results demonstrate the gold mineralisation potential of the Okvau and O’Chhung license areas. “All target areas are located within close proximity to the Okvau Deposit,” he says. Meanwhile, RNS is gearing up to drill at another prospect at Area 6 near the Okvau deposit called Rhyolite Ridge where rock chip sampling has retuned up to 11g/t gold along a 1,500m gold in soils anomaly. RNS says each target has sufficient scale to potentially host a significant gold deposit comparable to 1.2Moz Okvau Deposit. First pass C drilling is expected to get underway at Rhyolite Ridge shortly. Drilling at the Prek Te Prospect adjacent to the Okvau deposit has returned encouraging results, including 6m @ 2.4g/t gold from 90m and 9m @ 1.4g/t gold from 101m. RNS says exploration work including ongoing soil sampling, trenching, mapping and data interpretation will continue at its exploration licenses, and it will move to progress pre-feasibility study work on the potential development of the Okvau deposit.